Interact with nomads and learn their way of life. In your travel from western Bhutan to the east, see Bhutan’s diverse ethnic groups, flora, fauna, art and architecture. On the first day, you will take a scenic drive through Rangjung town and Radhi village from Trashigang for about ninety minutes to Chaling. Your trekking crew and pack animals will join you at Chaling. At the onset, the trek is a gradual climb towards Shaktimi meadow. Along the trail, you will see huts of yak herders dotted along the hill side and yaks and sheep grazing. As you ascent further, you will reach Mendula Pass, at an elevation of 3354m. After you cross this pass, the trek for the rest of the day is a gradual descend through forest filled with rhododendron trees till Donmong Chu, your camp for the night at 3124m. Your destination is Merak, and the trail follows the river. Apart from the final leg of the trek, it is a fairly easy hike along flat landmass. Right after you ascnd, you will reach Gangu village. In another 45 minutes you reach Merak, located at an altitude of 3520m. From your campsite located before the village, you can have a spectacular view of the nearby mountains and village. You have sufficient time to visit the village and interact with the people. In what is the toughest day of the trek, you will need to ascend until you cross the Nachungla pass, the highest of the trek at 4153m. The trek begins with a gradual uphill climb as you move from Merak, until the first pass at 3900m. A spectacular view of the entire Merak valley can be sen from here. It is also the pass from where you see Merak for the last time. Having crossed the pass, you will be trekking through outgrowths of juniper and rhododendron forests, finally reaching Nachungla pass. You will then descend to Miksateng at 3079m, your camp for the night. 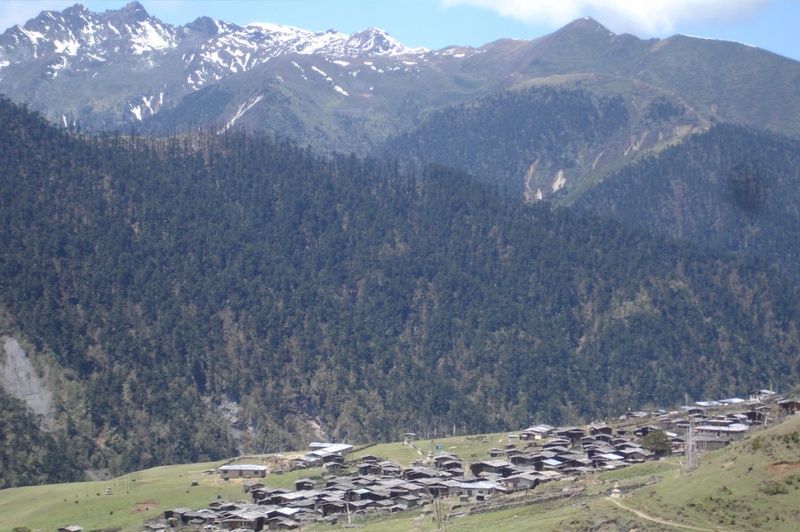 It is a priceless day for you as you avail the opportunity to visit Sakteng village, interact with the people and get to know the lifestyle and unique culture of this ethnic group. The people are a friendly lot and would willingly pose for photographs. The last day of the trek begins with a short climb through Joenkhar Teng. You will need to cross few suspension bridges and take short up-hill walks, until you reach Phongmay. Your vehicle will be waiting there and you will be driven to Trashigang. On the way, you will visit the Rangjung Monastery, founded by His Eminence Garab Rinpoche. After reaching Trashigang, you can take a stroll along the town. The night halt will be at a hotel in Trashigang.